Sen. Sherrod Brown (D-OH) speaks at a press conference at the U.S. Capitol following the weekly Senate luncheons on January 9, 2018 in Washington, DC. The Senate is expected to vote today on whether to pay to keep the federal government running and pay to construct a wall on the Mexican border. 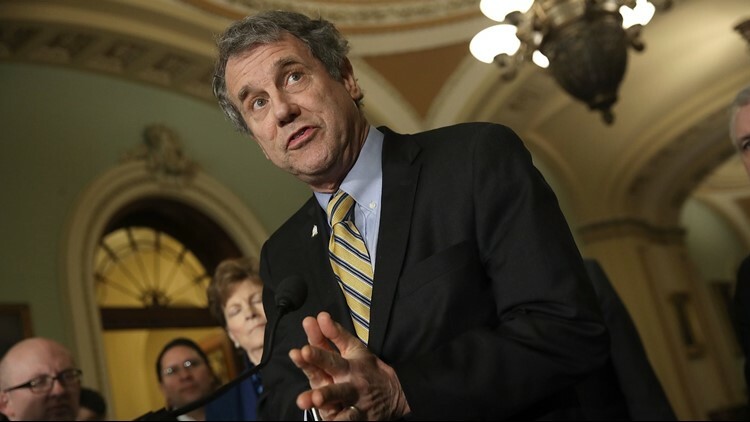 President Donald Trump's threat to shut down the federal government seemed like the actions of a petulant child to Sen. Sherrod Brown. The Democrat from Cleveland on Friday called Trump's threats a "temper tantrum." "While the Senate did its job and unanimously passed a bill to keep the government open, President Trump instead chose to throw a temper tantrum," Brown said in a statement on Friday. Brown, a possible presidential candidate in 2020, scolded Trump for threatening to not pay government workers over the holiday. The Senate will vote sometime today on whether to pay to keep the federal government running and pay to construct a wall on the Mexican border. If the spending bill doesn't include money for a border wall, President Donald Trump has pledged to not sign it, which would shut down a quarter of the federal government. "The president says he wants border security, yet he's forcing border agents to work without pay over the holidays, he's harming farmers who need FSA offices and food banks that rely on USDA over the holidays," Brown said in the statement, "and he's hurting working Americans who expect elected leaders to do their jobs." Some Republicans also disagreed with Trump's tactics but used softer terms than Brown. A government shutdown "makes no sense," Sen. Rob Portman, R-Terrace Park, said earlier this week. Unlike Trump, Portman in a conference call with reporters on Tuesday hoped to avoid a shutdown and seemed open to compromise. Border security could involve options other than a wall, including vehicle barriers and more surveillance technology, he said. "There has to be a compromise where border security is increased but we avoid a shutdown," Portman said. He stopped short of saying "no" to a government shutdown under any circumstances. It should be a last resort, he said. The first option, he said, is to pass a long-term spending plan. The second would be to extend government spending for the next few months. "The third option, the one I think is most objectionable, is a government shutdown," Portman said. "It makes no sense. I hope we don't end up there."